Several worship leaders and Christian artists have posted footage of a spontaneous praise session that took place in the White House yesterday. The “Faith Briefing” meeting was designed to give an update on all the faith-based initiatives that have been introduced by the Trump administration. In one clip posted by Christian singer Tauren Wells, a group of worship leaders can be seen belting out “What a Beautiful Name” by Hillsong Worship. Bethel Music’s director of events, Dominic Shahbon, also took to social media to express his delight at the occasion. “Wow. What a day,” he wrote on Instagram. “Had the honor to go the White House for a #FaithBriefing with key administration officials and faith leaders. Specifically, to hear about faith initiatives that are happening. Great things are taking place whether the media tells us or not! Let’s just say that I’m leaving Washington, D.C. stirred, hopeful, convicted and informed with TRUTH. Leaders could also be seen praying together. 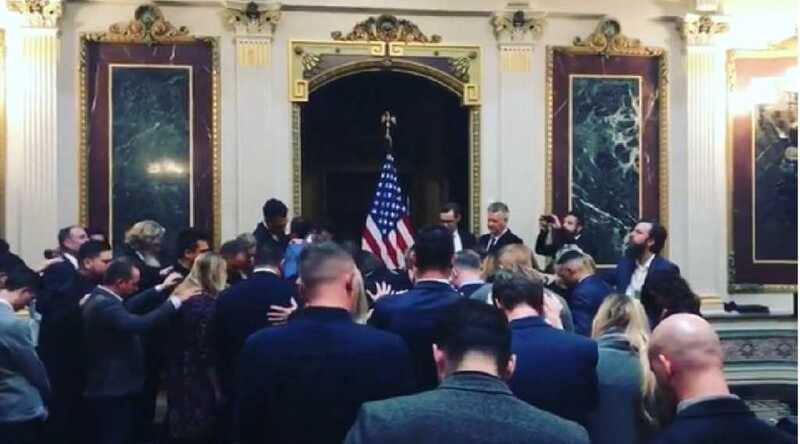 #faithbriefing — @bencalhoun what an honor to pray in @visitwashingtondc at the @whitehouse for some awesome men and women of God (including advisor @paulamichellewhite) who serve our country with @realdonaldtrump & @flotus – it was really special to pray and sing with our friends @danielolssonworld @michaeltait @jennjohnson20 @coltondixonmusic @building429official @jroymusic @micahtylermusic @jamesrueger @sidewalkprophets @swpdave @swpbenjamin @teresa_ferraro @sanctusreal @matthammitt @chrisrohman @dustinlolli @newsong_online @toriharpermusic @taurenwells @jimscherer @joshuamicah @scott_brickell @karijobe @codycarnes @theyoungescape @rileyclemmons @dannygokey @leyicet @jjweeksband @sarahreevesmusic @teresa_ferraro @cleader86 & @jonathancainmusic of @journeymusicofficial #bucketlist #jesussavesbro IN JESUS NAME! The gathering appeared to be organized by Pastor Paula White, a megachurch pastor from Florida and the chair of President Trump’s faith advisory board. White’s husband is former “Journey” keyboard player, Paul Cain, who was also in attendance. It was certainly cool to see the name of Jesus lifted high in the most famous building in America!